Especially with a new cat, you have to try to make your cat feel at home. 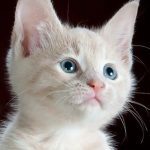 There are at least 7 things and methods that you can use to give your cat a place within your family and create a great bond between you and your cat. Why Would You Make Your Cat Feel At Home? You would want to make your cat feel at home to have a truly happy, healthy and thriving cat in your family. A cat that feels truly at home, will also give back to you. Cats are truly loving animals that will be your lovely but quirky family member that you can talk to, cuddle with and enjoy playing with. A new cat might take some time to bond with and that’s why we come up with these ways to make bond with your cat and make your cat feel at home in your house. First of all your cat needs some of the most important things sorted for them. They will stay with you when you offer them food, water and a litter box to defecate. That is the absolute minimum for having a cat in your house. Unfortunately these things do come in all shapes, sizes and types. Not all cat food you can buy is good for your cat, nor are all cat bowls equal in quality. While an outgoing cat might do their toilet business outside, in winter or in urban area’s cats will have to stay indoors which means they need a place to do their toilet business in your home. 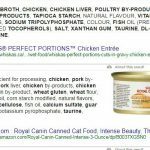 Good quality cat food is cat food with a lot of meat protein content. Cats are meat-eaters, simple as that and hence they need that in their food. There are different types of food and food quality, so choose for the health of your cat and not necessarily best for your wallet. Your cat needs a food bowl. One piece is an absolute minimal, but if you are going to offer wet food, then you have to have a separate one for that, mainly because of bacteria. Food bowls need cleaning often, every day or after every meal. Food and drinking bowls need to be of the right quality and type of material. Certain materials are more difficult to clean from bacteria. Bacteria left behind in food and drinking bowls are health hazards to cats. Like humans, cats have troubles staying properly hydrated. Luckily wet cat food gives your cat 70% of their daily intake, but most cat owners feed their cats dry kibble (very little water content). A drinking bowl is absolutely necessary for your cat to stay optimally hydrated. Keep the drinking and food bowls clean daily so that bacteria and algae have no chance to grow and be a danger to your cat and refill the bowl with fresh water. As with food bowls, certain drinking bowl materials are more difficult to clean. Bacteria that are left behind in drinking bowls are a health hazard to your cat. To make it more interesting for cats to drink, you could think about adding a cat water fountain to your collection. If that is too much money spend for now, then at least get a good quality drinking bowl for your cat. Unless your cat is supposed to stay out or be out a lot, your cat will need a place indoors to take care of their toilet business. This place is usually a cat litter box filled with cat litter (sometimes also referred to as cat sand). In the old days people used old newspapers or fireplace ash. Those types of cat litter are highly silly to use, unless you love cleaning your floors from black spots all over the place or the stench of urine-drenched newspapers. This cat litter should go in a decent sized cat litter box. We reviewed a Top 3 Cat Litter Boxes as well as the Sifting Cat Litter Box By Arm and Hammer. To include a cat in your life and into your home, you need to allow them as a part of your family. They should be allowed to go in most places in the house, they also should be having a place they can sit or sleep. Perhaps you will allow them on your sofa, chairs and bed, but a lot of people do not allow that and constantly move their cat away from the places they don’t want them to be. The least you can do is give them a cat bed. That cat bed can be theirs and they can do what they want with it. 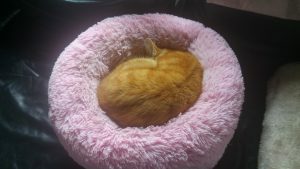 There are many advantages of having a cat bed installed in your house. Cat beds will contain the hairs in that one place. Well that is wishful thinking of course, but at least there will be less of their hairs on the sofa where you just sat down in your nice clothing. An even better place to sleep for them is a cat bed that is situated in a cat tree. These structures give a dedicated place to cats to play and sleep as well as something I discuss in the next point. Cats need to sharpen their nails constantly. It is an instinctual thing as they make themselves ready for the next hunt for prey. They also need their nails to climb, to balance, to scratch and itch, to fight (although that you would rather not have them doing) and to groom. In short, you cannot prevent them doing so, but you can definitely redirect the sharpening of nails on the appropriate place. We all want to keep our furniture looking somewhat nice, right? 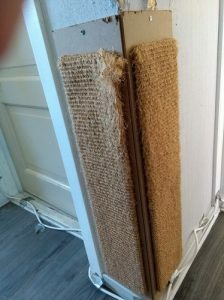 So at the very least install some scratching boards on your walls or protect your sofa corners with them. The scratching poles and scratching boards come in all shapes and sizes and fit to most peculiar area’s of your house. The easiest still of course is to install a cat tree, as they usually tend to come with at least 4 of these scratching pole posts. A cat tree will also offer your cat a dedicated place to be at and sleep in. Last but not least, if you want to make your cat truly feel at home in your home, you should buy a couple of nice toys so they can play with that. 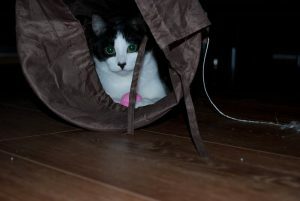 Cats are excellent hunters and want to practice that also indoors with a couple of cat toys. Young cats play with everything, while older cats might be more specific on what they can be bothered with. Laser pen’s are awesome. They put this nice (usually) red dot on the floor or wall and your cat will go crazy trying to catch the thing. Even our adult cats go amok on them. A normal cheap laser pen will be totally in your control and you can put the red dot anywhere you like. Just be careful that you don’t shine the laser beam in their eyes. Laser pens are dangerous and can cause permanent eye damage. Going one level up from the basic laser pen and you will find toys that can either be remotely controlled through an App on your phone (with camera to do so remotely from another location too!) or have some sort of motor that will make a pattern of follow-the-laser-dot for hours of fun on your wall. Not to confuse feather on a stick with carrot on a stick, although they got the same effect. Cats are not too amused with carrots, but they are way more amused with a mouse, a long furry tail or a bunch of feathers on that end of the line. You can make your cat jump up to catch the feathers or run after that mouse on a wire through the entire house. These sticks are usually inexpensive and are an absolute joy. The stick requires however still mostly your interaction in the playground. There are also mice that are individual and can be caught, hunted and pounced down. 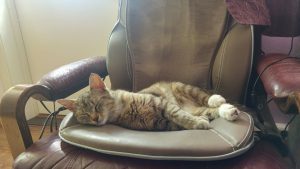 As a last note however, if you are looking into growing the bond with your cat, you should really interact with your cat – a lot -. Don’t just give them a toy they can play with while you are gone. While a mouse on the loose is fun and can be thrown about and played with, a ball is the absolute winner. Especially around our kittens in the family, but you will also find popularity among the adults when we are not looking. Hey, they are just secretly enjoying this, you know?! Balls do roll… and roll a lot. Ever seen a cat play soccer? Well now you can. Give them a tiny ball, not too heavy though, and you will most likely get that effect. They can enjoy this toy entirely on their own, but some interaction will help you grow your bond with them. I tend to lie down on the floor and push the ball towards them. Nusse is a pro at soccer and paws her ball all across the room. When it bumps into me, I roll it back to her and together we have a lot of fun. Catnip is a herb that cats either respond on in a totally crazy manner or it will be ignored just for the heck of it. Catnip is a herb that can make your cat either totally nuts or completely slow down relaxed. It is a must-have in any cat-family and can help in both training a cat to use certain area’s as well as a relaxant to make them feel at home. For those cats not responding to catnip, there is also something called Silvervine Sticks. Silvervine is made of the Kiwi plant and cats might also respond to the smell and taste of this plant. If you got a very stressed out cat at home, you might want to install a pheromone diffuser that spreads a calming scent that we humans cannot smell, but cats will sense it no problem. The calming scent reminds them of their mother and will make them feel at home. Do understand that this diffuser needs to be active for a couple of days before it starts to work for your cats in the house. You also might have to install several of these diffusers depending on the size of your house. Alternatively you can use a pheromone spray to spray certain places in your house, such as a cat tree to help your cat feel at home in these designated places. What other items could you think of to make your cat feel at home? Leave your suggestion in the comments below! Hi, I loved your article. You are an attentive person. You have so much care. Here are some things I do. I found a pinwheel with Fourth of July theme. I put into the base of a mini fan ,safely of course. Pull up the plug so no movement.Then I set it up in the window during spring and summer.The breeze spins it. Also, I bought a cardboard condo for 12$..I draped a blanket and made a fort with an his cat carriage. I put battery operated mini candles on the floor in the fort. I got some carpet samples at carpet store for 1$. He likes to scratch them .You can rearrange them .I use them for training him to not scratch the furniture I put catnip on it. I put a mirrored candle holder on top of a tall fan with a swivel (A flat surface). Set a small mini disco light .You can get at Halloween stores ,Spencer’s ,Walgreens,dollar store .That spins,lights up on top of candle holder and turn the fan on. Special note- make sure the candle holder is SECURE WITH TAPE OR ELMERS GLUE.. Wasn’t being practical ,it crashed .It did spin and reflected thousands of colored lights and disco mirror lights.. I The sun shines and makes the reflections. Yes he was bedazzled and enchanted.He jumped up and chased it . Also I tuck a string or yarn with tinkle ball into my pants waistband or tie loop and walk around and he chases. Thanks very much for your lovely words! What a cool ideas for making your cat feel at home. I am very sure that your cat is taken very well care of. I love the ideas that you shared with us. Some of them are even not expensive at all. Perhaps you can send me some pictures of them so that I can try to include them somewhere or give them a place on a separate post? Our cats also love to chase after strings and rope toys.